The New England Patriots are now tied with the Steelers for the most Super Bowl wins (6). 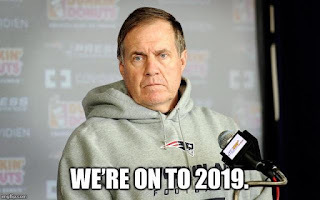 The Patriots subreddit is gonna be LIT tonight. You've indicated the upcoming TV ratings for the Oscars apparently won't be about the changing business of broadcast television. They will be a powerful reaction against "wokeness" and #MeToo and social justice. Shall we also assume that the Super Bowl's ratings drop is due to Brady, Belichick and the Krafts' close association with Donald Trump? Again, it can't be that broadcast television ratings are down for everything everywhere. That Occam dude is a total liar. Why can't it be Colin Kaepernick's fault? There's a whole caravan of diseased Colin Kaepernicks a-heading this way!